Restoration Companies Greenwood - Welcome to Wall 2 Wall Restoration! Are you a homeowner or a business owner who has had water damage, either from a flood or a water leak, or had a fire, leaving your home or business with fire damage? Have you experienced a mold outbreak that needs to be taken care of? As a result of these unforeseen damages to your home, were you left with a musty, unpleasant odor that needs to be removed? 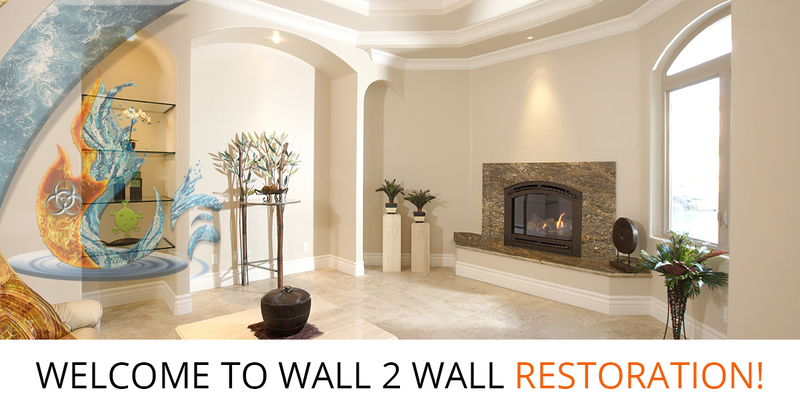 If so and you reside in the Fort Smith or Greenwood area, Wall 2 Wall Restoration is a restoration company that specializes in helping property owners recover their homes, their valuables, and their life after an unplanned disaster, either man-made or by Mother Nature. Below, we’ll detail a bit more about our individual restoration services, and remember, if you experience any of the aforementioned disasters, call our certified and professional restoration technicians today! We’ve probably all had either a water leak or experienced a flood at some point in our home or business. Water is an integral part of our lives and sometimes things just break. When you experience excess water in your building structure, you’ll need to call us, the best water restoration company near Fort Smith. We will come to your home or business as quickly as possible, assess the damage, and get to work right away in removing any standing water and drying out your space. It’s important to get this space dried out as quickly as possible to prevent nasties from growing such as mold or mildew. Once all of the water is removed (or extracted), we’ll assess the damage in order to see if water damage remediation is required, which is the process of removing the damaged structures, such as drywall, wood paneling, and flooring, and get that replaced as soon as possible. Foul odors may be present or may form in the following days after your water damage, in which case Wall 2 Wall Restoration can eliminate these odors quickly and efficiently. We’ll continue to stay in contact with you in the days after water damage remediation in order to ensure it’s business as usual. We’ll work with your insurance company to help process claims as needed. With fire and smoke damage restoration, our processes are very similar to water restoration and extraction, just using different tools. However, first things first. Depending on the fire damage to your home, we’ll secure your property with fencing and board up any windows or other access points to ensure marauding vandals don’t take advantage of your disaster. Wall 2 Wall Restoration will make sure the damaged structure is safe for re-entry, and we’ll recover some of your initial valuables at this stage. We’ll assess the damage, dry out the property from the water used to put out the fire, salvage any contents we can, and document everything along the way for insurance purposes. Fire debris will be removed as well as all structures that suffered smoke and/or soot damage from the flames. Odor removal is the last step in the fire and smoke damage restoration process. Mold is not only unsightly but is potentially dangerous. Mold needs moisture in order to grow. This is why you find it in your showers and in places in the home that has been exposed to water. Mold can release spores that can cause a wide range of health problems in humans, including chronic coughing and sneezing, irritation to the eyes and nose, rashes, and chronic fatigue. It feeds on the organic material in wood, drywall, and carpet. Wall 2 Wall Restoration in Fort Smith is a certified mold remediation specialist. We will first test the mold in your home to determine its type. Then, we’ll develop a plan to rid your home of the mold infestation, which will first involve isolating the area, so its pores don’t spread. We will then initiate the mold removal process, which will entail the removal of the infected areas, such as drywall or carpet. The whole area will be processed and vacuumed with special mold remediation equipment and chemicals. The mold will be removed and disposed of safely. Finally, an independent industrial hygienist will test for any mold and certify that the home and/or business is now safe to occupy once again. Wall 2 Wall Restoration in Greenwood also offers emergency services, contractor services, boarding up and roof tarping, packing out contents and storing it, and cleaning and refinishing contents. Anything that needs to be restored due to water, mold, fire damage, or other disaster in the Greenwood and Fort Smith areas, we can help. Contact us today!